Here’s a new kernel manager for Antergos, and it should work also on Arch. in the directory where the PKGBUILD file exists. The program installs as file /usr/bin/akm. with root/sudo permissions. So far I didn’t create a .desktop file that you could simply click to start the manager. But it is quite easy to do yourself, too. I plan to include it in the PKGBUILD later. 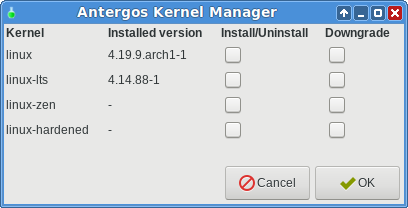 The program installs/removes/downgrades the kernels that you see above. It also manages related kernel header packages. It requires packages yad, downgrade and xterm to be installed, and warns if they are not. found the reason and fixed it. I forgot that you use zsh, not bash! For zsh the parameters of the tr command were not suitably quoted. And the akm.desktop file was added. The elevated privileges are now handled inside akm using the pkexec command. Version of akm is now 0.1.8. Still fixed some minor bugs, like the .desktop file is now properly installed. Since I haven’t used systemd boot (have only used grub), what is the command to regenerate systemd boot menu? Other things are now fixed, and it will be available soon. what is the command to regenerate systemd boot menu? Please test this new version, especially the systemd boot stuff, since I have no machine that uses systemd boot. have no machine that uses systemd boot. @edneyhelene @manuel Antergos Repository would be the right place for a package for Antergos. Now the next version 0.1.13 doesn’t anymore require the xterm package.